::cough:: ::cough:: Pardon me while I blow some of the dust off the blog. You’ll probably know that this is important if I’m of a mind to post again. And this is! 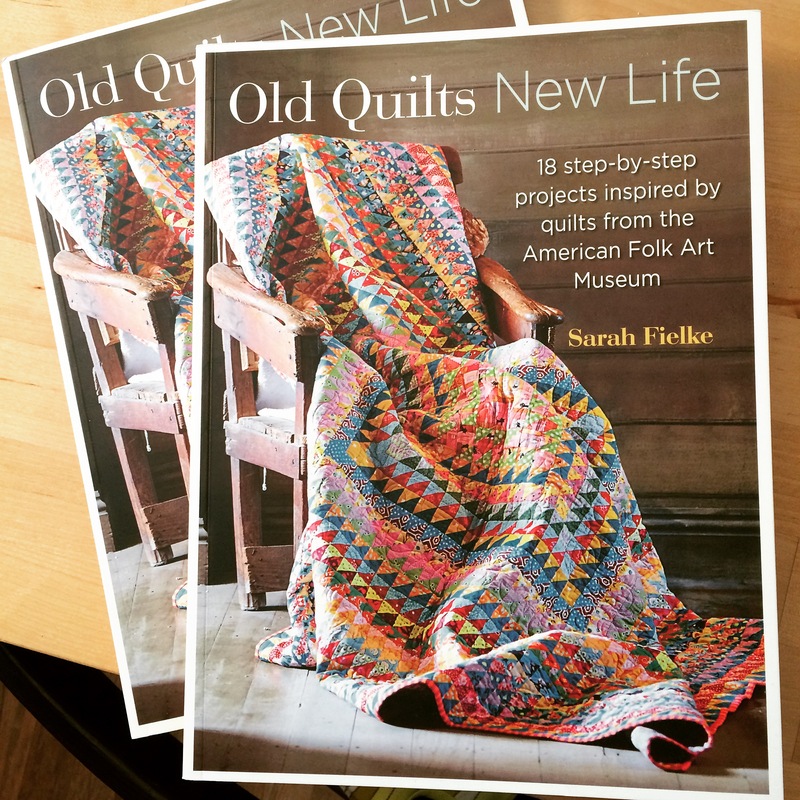 I’m helping to celebrate the launch of Sarah Fielke’s new book, Old Quilts, New Life! First, congratulations, Miss Sarah, for a fabulous, fabulous book! 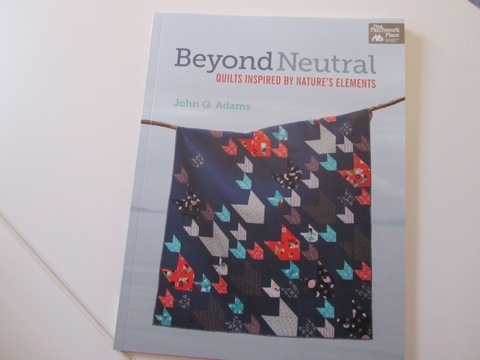 Yours are always to be looked forward to because they are chock full of quilt goodness and they are lovely books to boot. 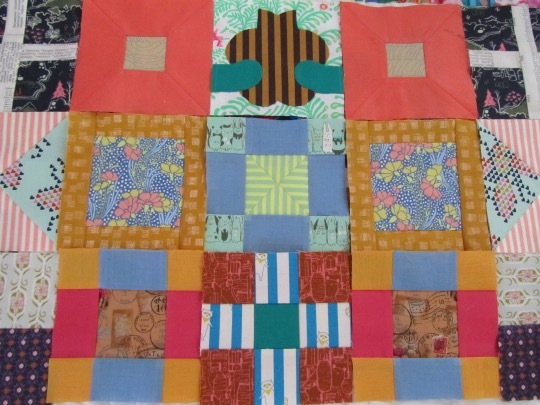 In this one, Sarah chose nine quilts from The American Folk Art Museum collection and made two versions of each quilt for the book — one is a close interpretation and the second a more contemporary take. 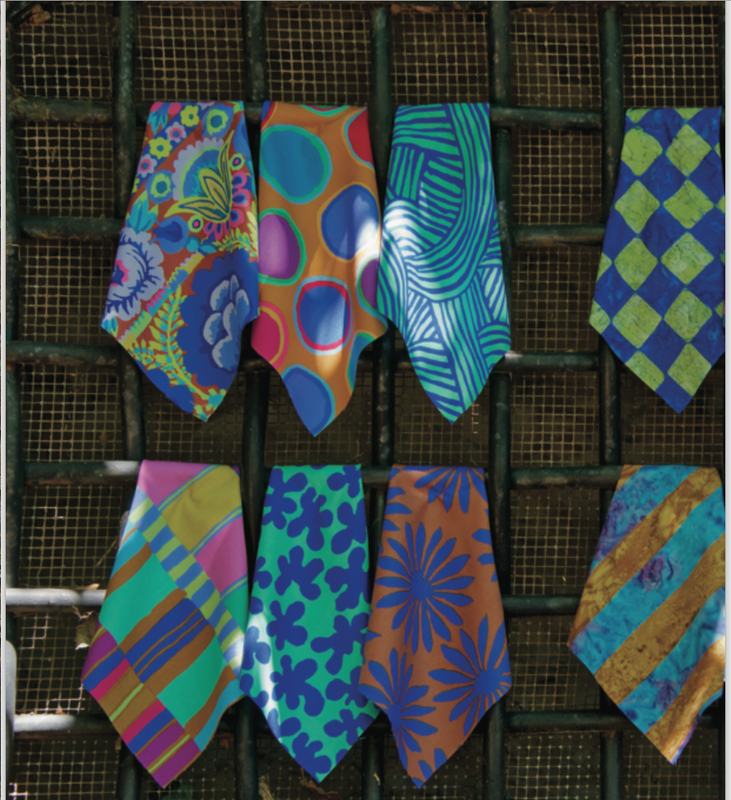 You will note with a deep breath, I hope, the tremendous amount of work that goes into such an endeavor. I am always in awe. 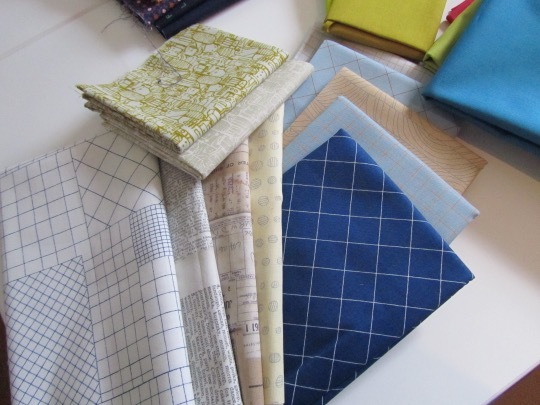 Sarah always makes me want to be a better quilter. And not a slacker…ahem. 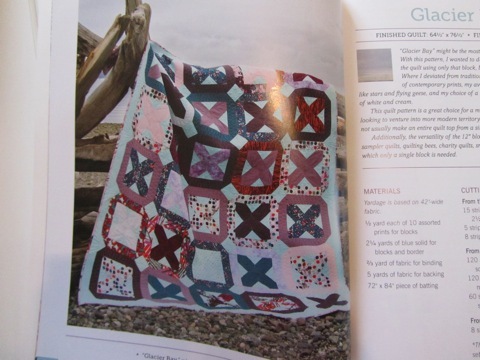 So, yes, the book has all the instructions for 18 beautiful quilts. 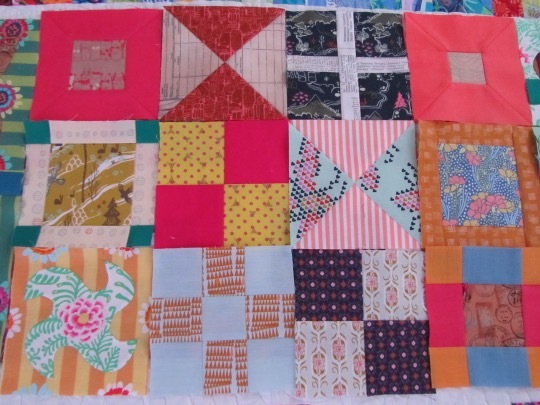 I hope I am a known appreciator of antique quilts. 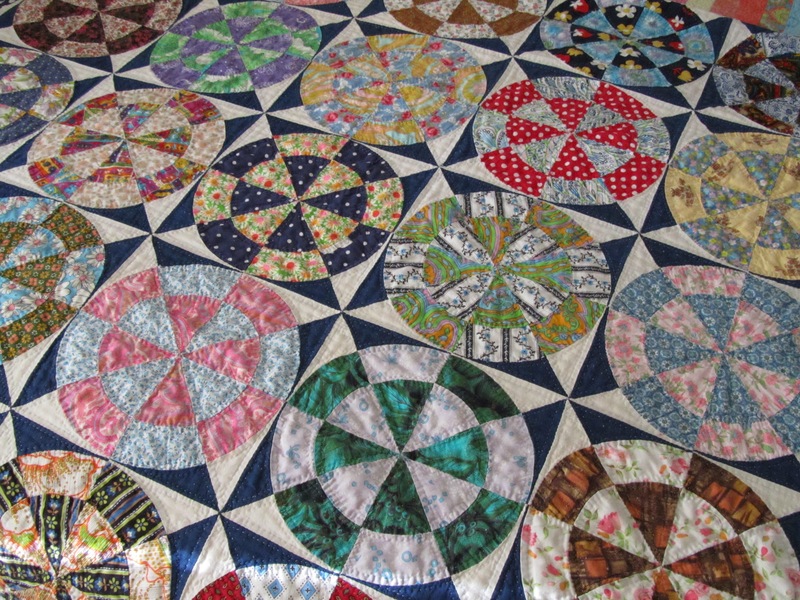 I find lots of inspiration looking at quilt history books and photos of antique quilts. So, of course, I awaited Sarah’s latest book with great anticipation. I so greatly anticipated it that I pre-ordered two copies (one early on, one more recently — completely oblivious….). 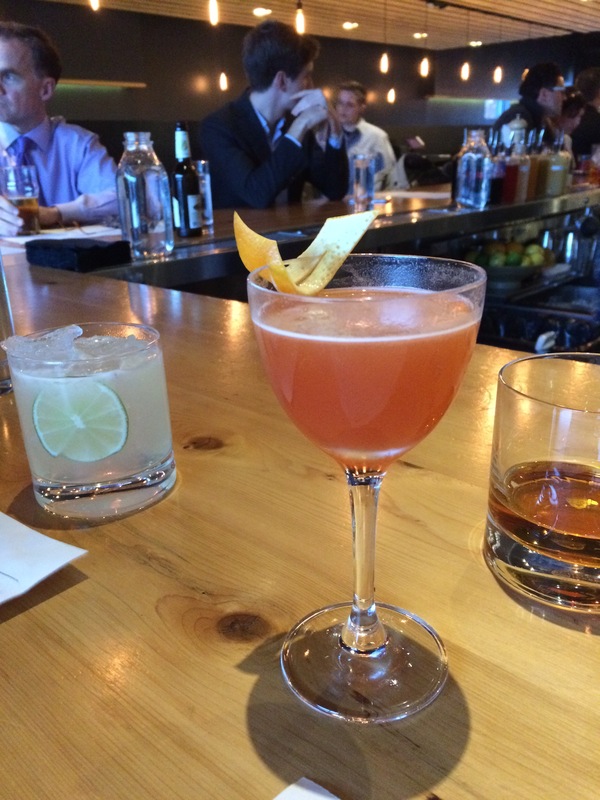 See, there she is — the lime and gin on the left. She was able to autograph both of my books in person. Lucky, happy girl! 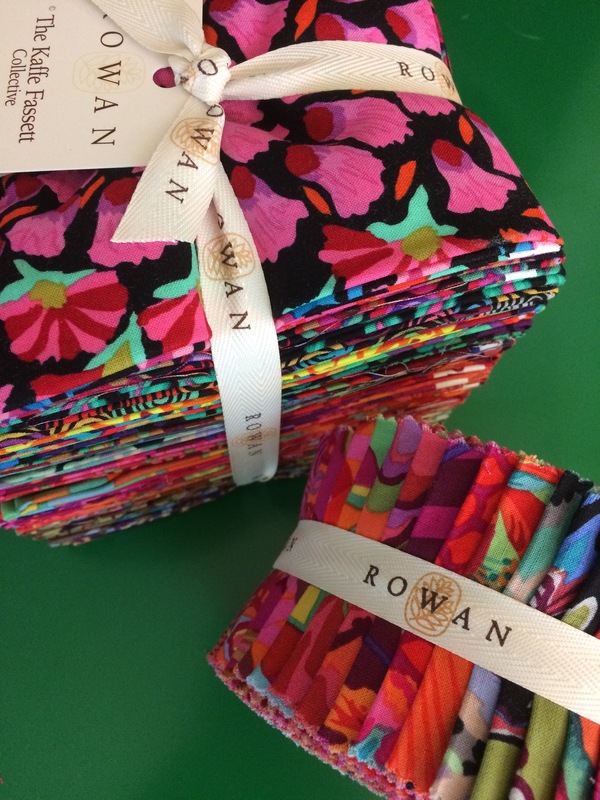 But on to quilt business. 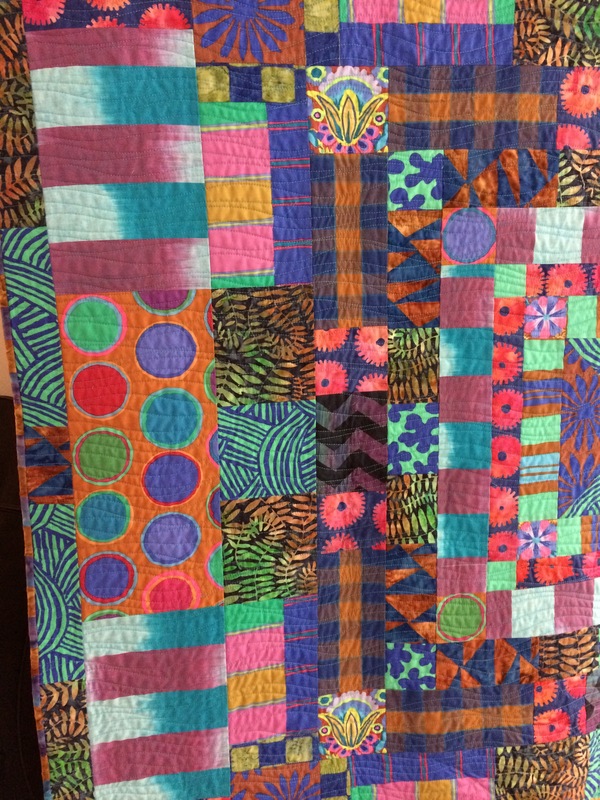 Sarah asked us to select an antique quilt we admired. 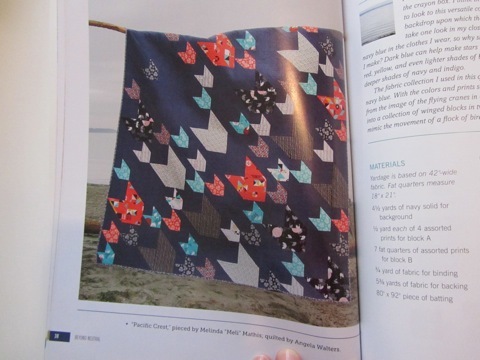 I knew immediately which quilt to choose. 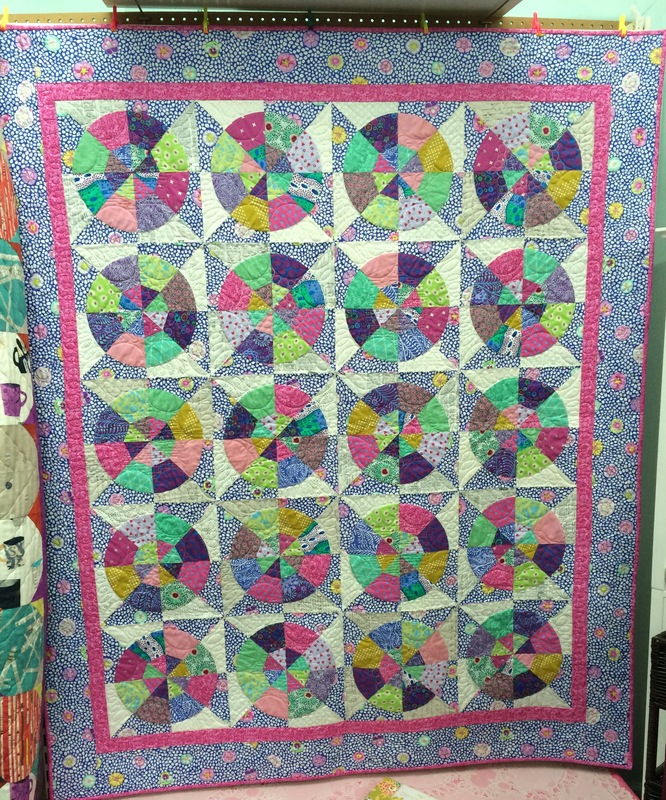 I don’t know that it is my favorite block (I always say the churn dash), but it is a very fine example of the circles that I like. I also don’t know that it is truly antique but more of a vintage find via eBay. Yes, I acquired this and another treasure from a seller a few years back. It is in great shape and is nice and big. 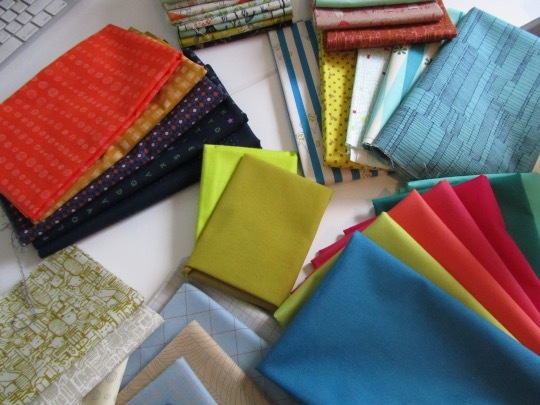 The collection of fabrics in it is wonderful. 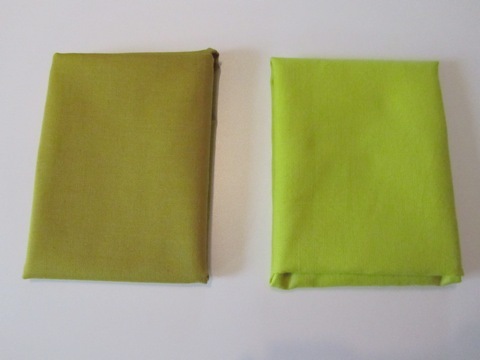 I’m guessing it’s from maybe the 1950s based on the fabrics. 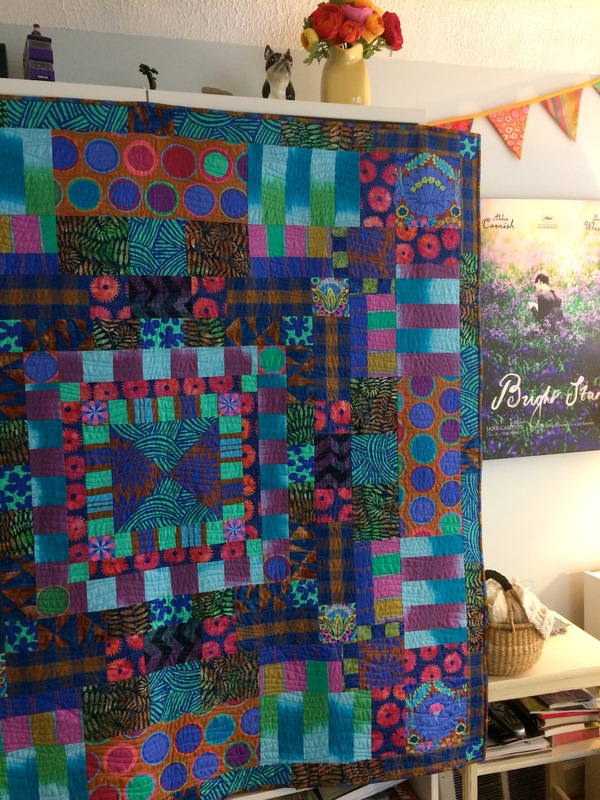 Oddly enough, when Sarah asked, I had just completed this Hot Wheels quilt from Kaffe Fassett’s latest book, Heritage Quilts. 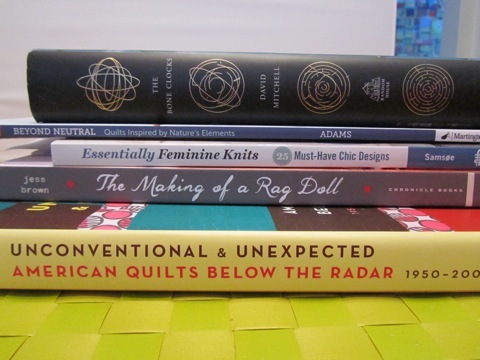 And, so, history has repeated itself, and I’ve shown my continued affinity for all things circular. 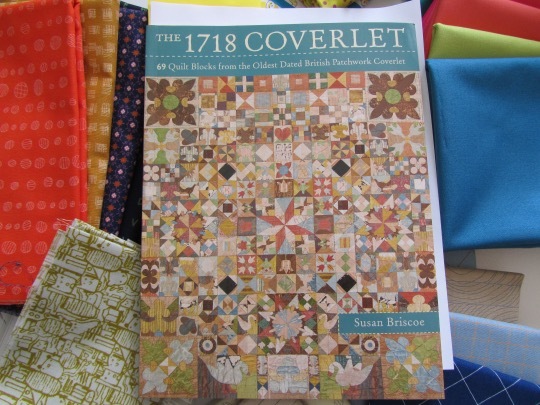 I hope you’ll have a look at Sarah’s new book and around you at quilt history — there is so much inspiration to be found whether you want to re-write it verbatim or edit it to suit your tastes. 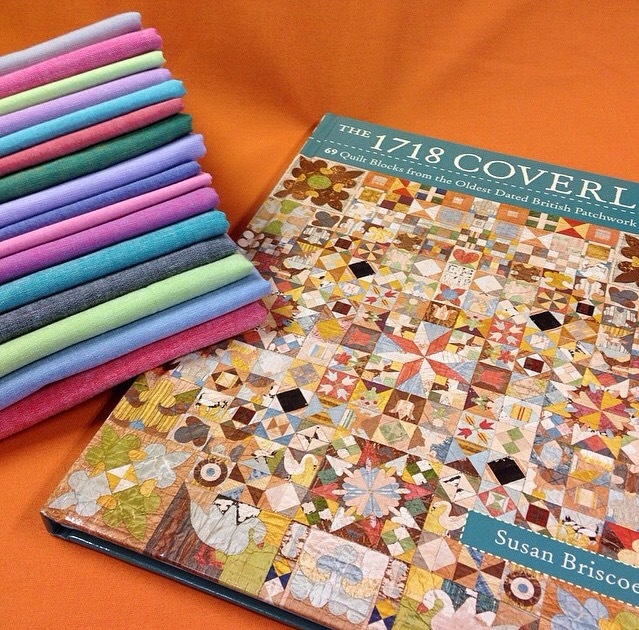 Our quilting forebears left us with lots of inspiration and so has Sarah! Congrats on a spectacular new book, old friend, and cheers to revisiting history! 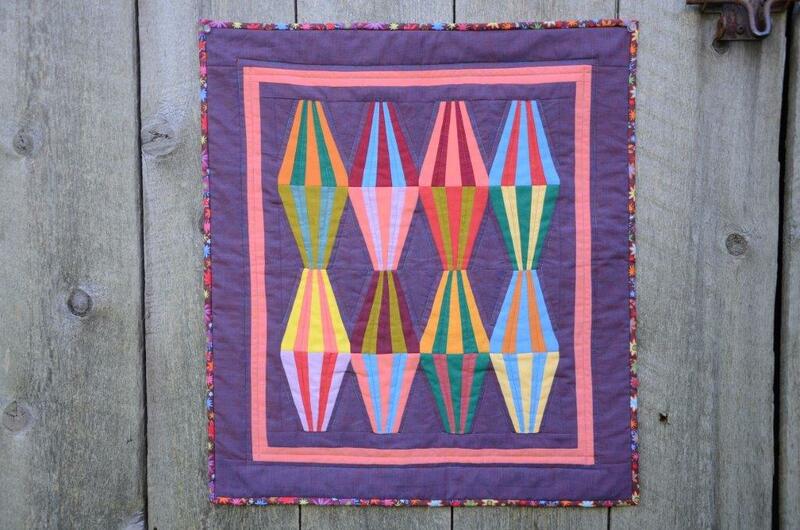 Instagram: @sfielke (and be sure to search for the #oldquiltsnewlife posts of favorite antique quilts. 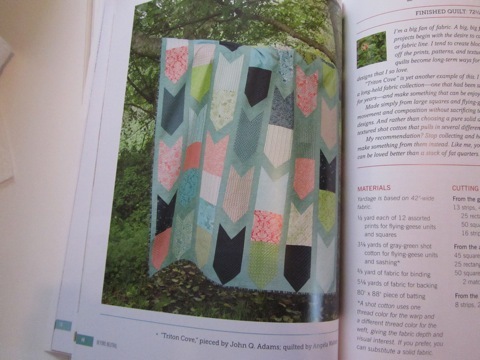 It’s the last stop on our Little Quilts blog tour. Katy’s post for it had me all weepy. What a gem of a pal! 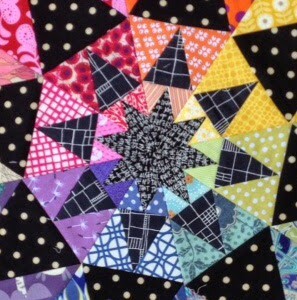 I’m excited that Katy is working on my Candy Is Dandy pattern for her partner. 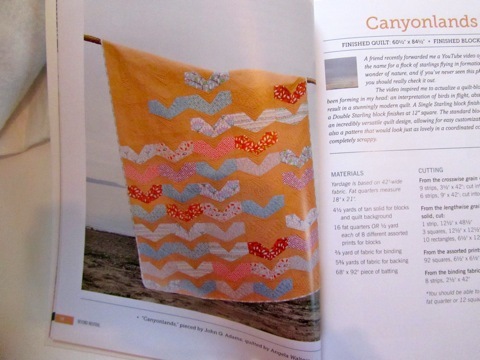 She is making it with Peppered Cottons and the GORGEOUS Alison Glass batiks (can’t wait to get my hands on these!). Quite thrilling, if you ask me! Katy is hostessing another book giveaway this week, so rush over if you haven’t already done so! Thank you, Miss Katy! 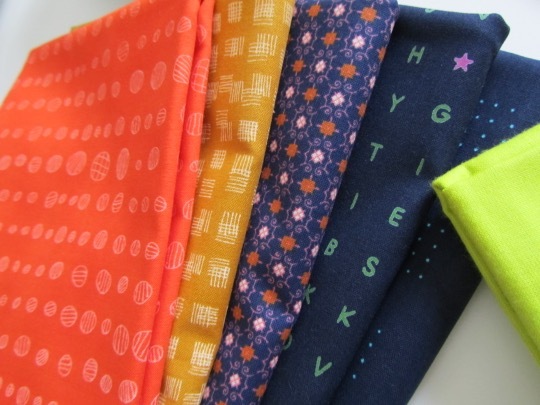 She is a very busy girl at the moment prepping for her first fabric line, Priory Square (also, can’t wait to get my hands on these), at fall Quilt Market and, oh, you know, her regular job over at Quilt Now. 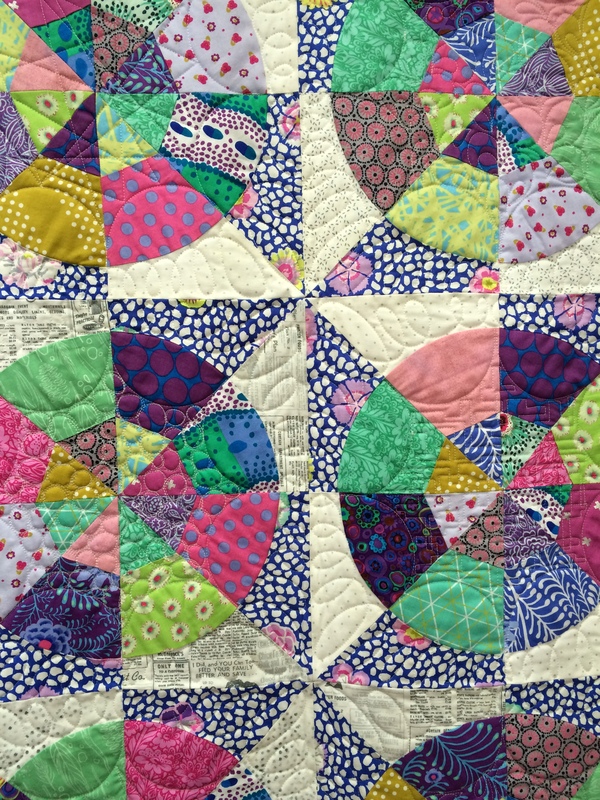 Sarah and I soooooooooooooooo appreciate the time and effort all of our blog tour participants put into their posts and their mini quilts for swapping! We have wonderfully busy friends!! And speaking of our very busy friends, my (secret) swap partner for our little blog tour was none other than Miss Pamkittymorning! 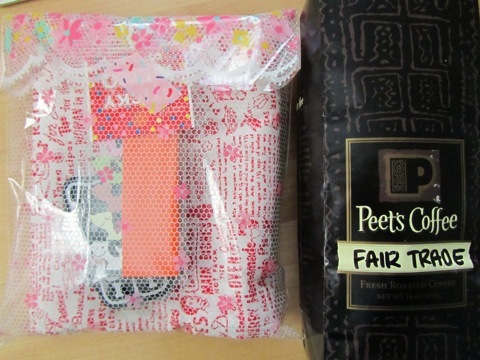 Anyhoo, Pam knows me well and sent a wonderful bag of Peet’s Coffee, the aroma of which has put a permanent smile on my face. May have to grind some beans after I finish this post. Pam, I’ll try to send you a slice of pie! 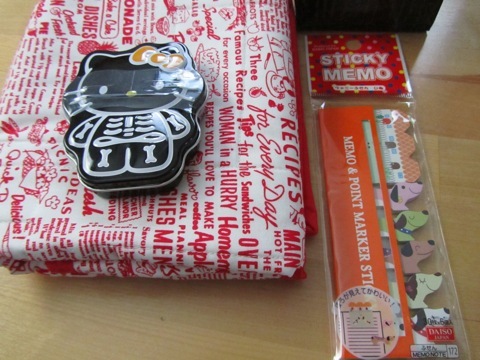 Pam also sent sent some Daiso and Hello Kitty cuteness. The dogs are going to help me keep track of my knitting. Good dogs! 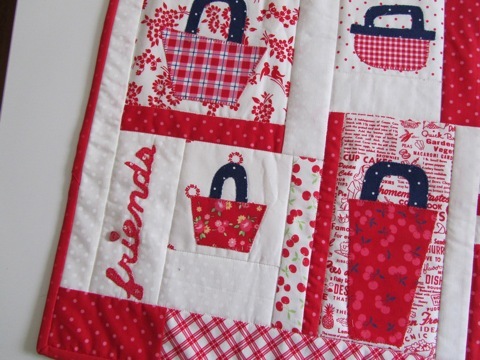 Pam (secretly) made my Polka Dot baskets quilt for me!! Seriously?! I ADORE this day-brightener! 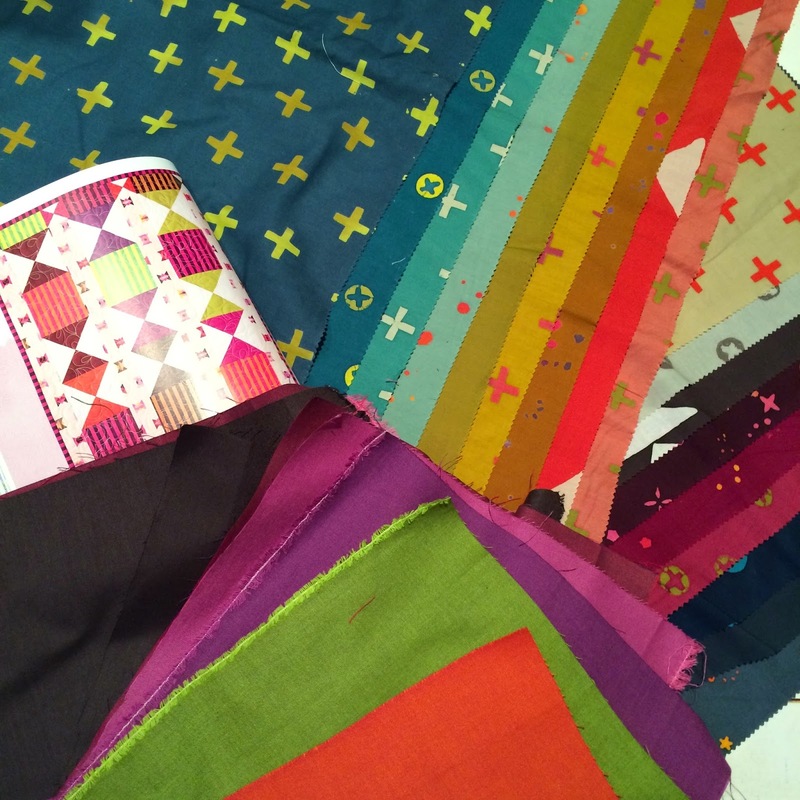 I’m so very excited that she used lots and lots of her own (cheerful) fabrics! 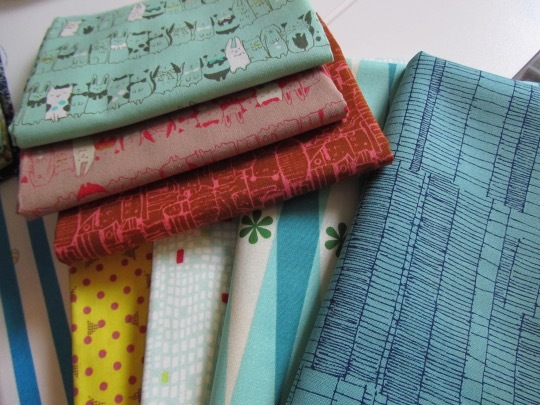 Look at all of the Pam Kitty Picnic fabric. 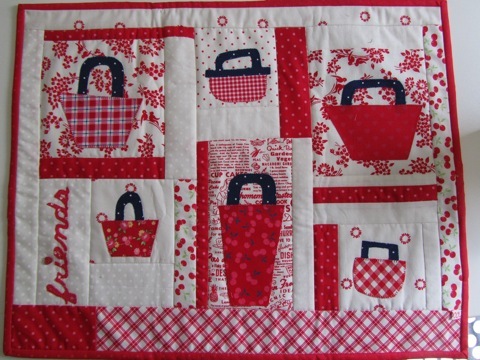 Those wreaths and that Recipe for Success fabric are killing me! The plaids?! And, say, wouldn’t it be fun to have your own category at Fat Quarter Shop?? Celebrities do, you know. Clever girl that she is, she changed up the “baskets” embroidery in the pattern to a “friends” applique (impressive with all of its small curvy parts and that professional buttonhole stitching — she’s good, that one!). 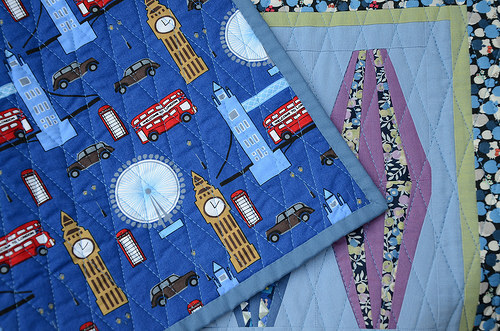 As you can see, the little quilts from our little swap are starting to make their way around the world. I’ll be sure to show you who received what and from whom. Krista (who, by the way, has a book coming out in February!!) received this Cocktail Shakers beauty rom Nedra. 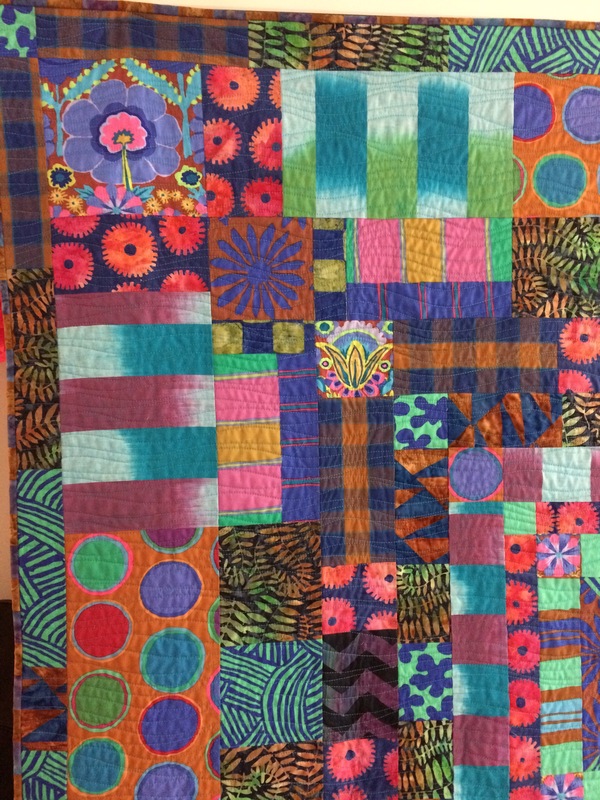 I love love love the colors Nedra used! 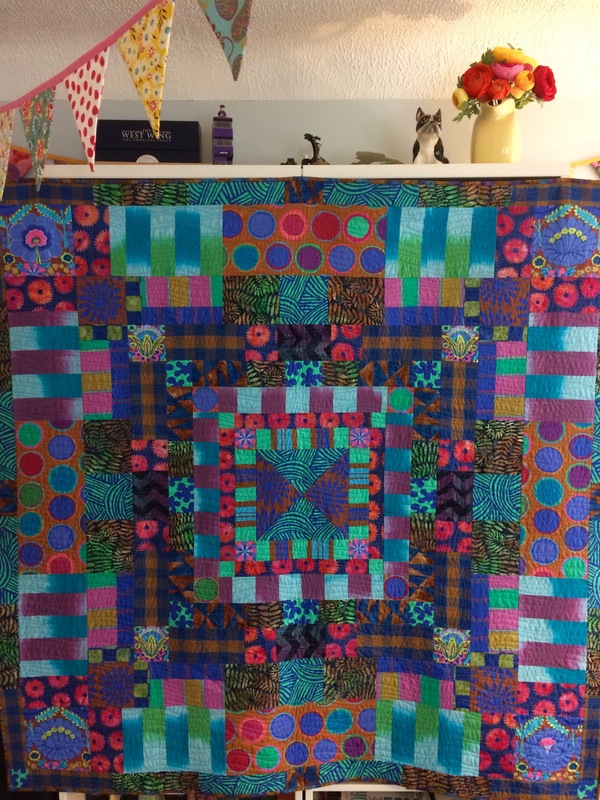 It’s kind of vintage circus-y to me (sorry, I may have American Horror Story Freak Show on my mind — vintage circus-y and very creepy) (Nedra’s quilt is absolutely NOT creepy). 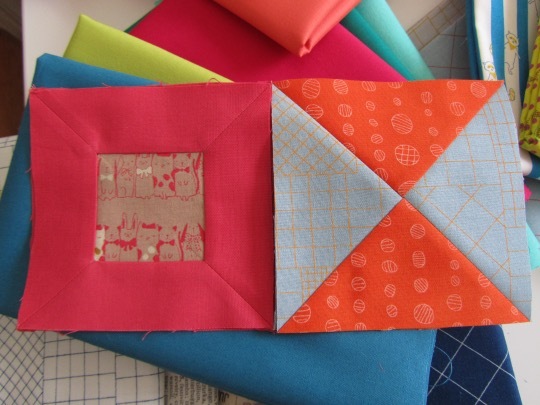 In other swap news, I signed up for Sarah‘s Little Quilts mini swap. You know, the swap she created when she was hunting for a swap to join. You know, the swap she’s not actually swapping in. Makes me chuckle but in kind of a sad way. For her. 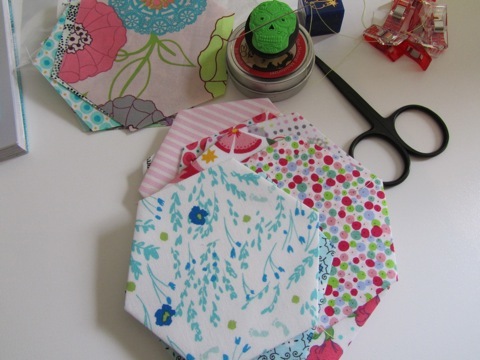 I decided to make Sarah’s Honeycomb quilt for my partner because who doesn’t adore that bee? 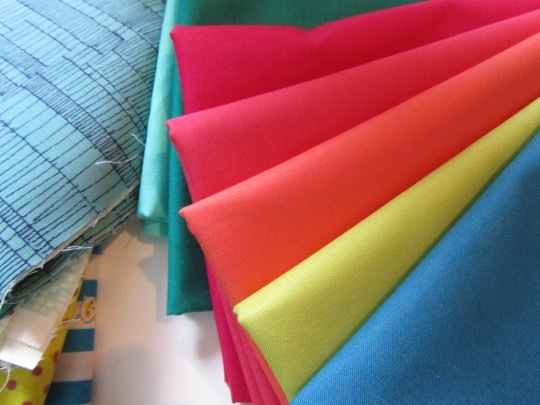 I’m going to practice my embroidery skills before committing it to my hexagon base. PLEASE do not screw this up. 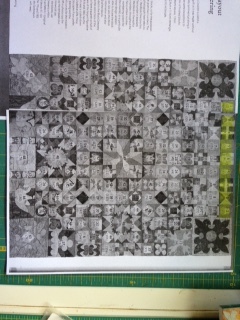 But so far, so fun with the hexagons themselves. And, with that, I’m going to go grind some beans and make a fresh pot of deliciousness!